Mirror mirror on the wall, which Vietnamese land is the fairest of them all? And the mirror says: “Halong Bay is the fairest of them all!” Halong Bay, one of seven world wonders, is hands down a must-see attraction for every traveler when coming to Vietnam. Are you wondering about the best time to admire this beauty? Don’t worry, I have you covered with this article! Halong Bay, which means “the Bay where the dragon descends”, is located on Vietnam’s northeastern seacoast – Quang Ninh Province. 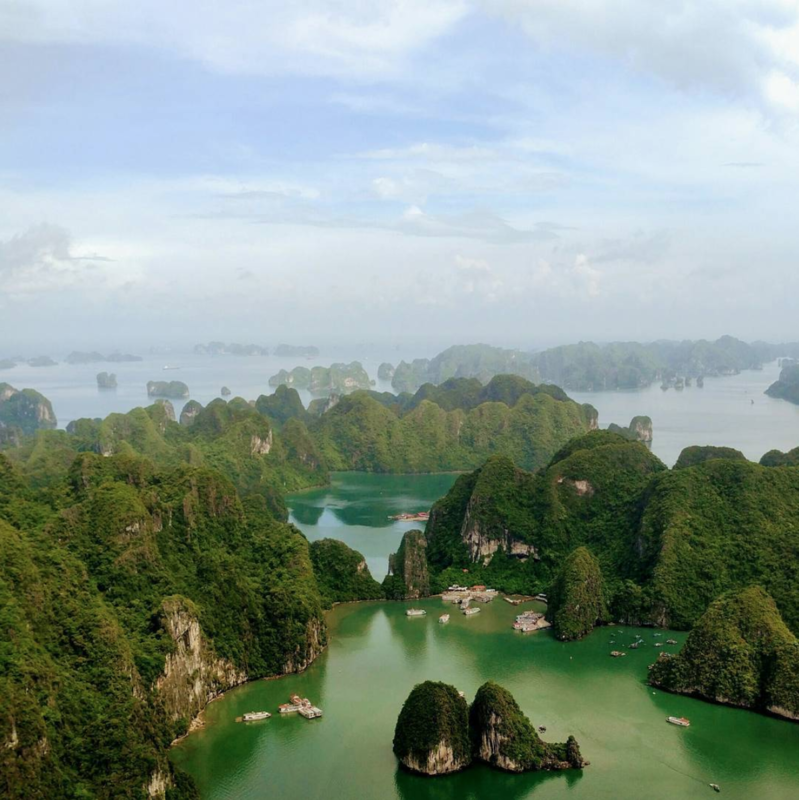 Even though it’s only 170 kilometers from Hanoi to Halong Bay, this beauty can surprise you with thousands of islands rising from the emerald water. 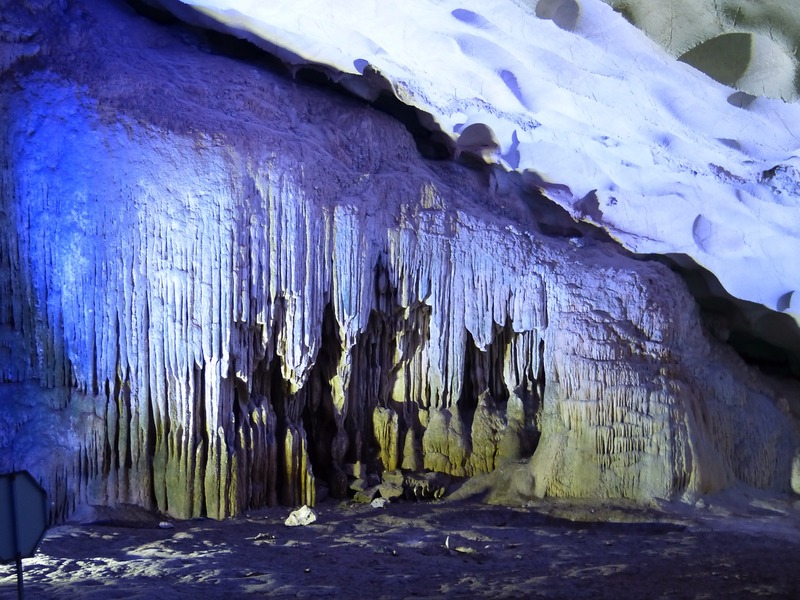 It was recognized by UNESCO as a World Natural Heritage Site in 1994 and 2000 for its aesthetic and geomorphological value. With its breathtaking scenery, Halong Bay officially joined The Club of The Most Beautiful Bays of The World in July 2003 without any doubt. 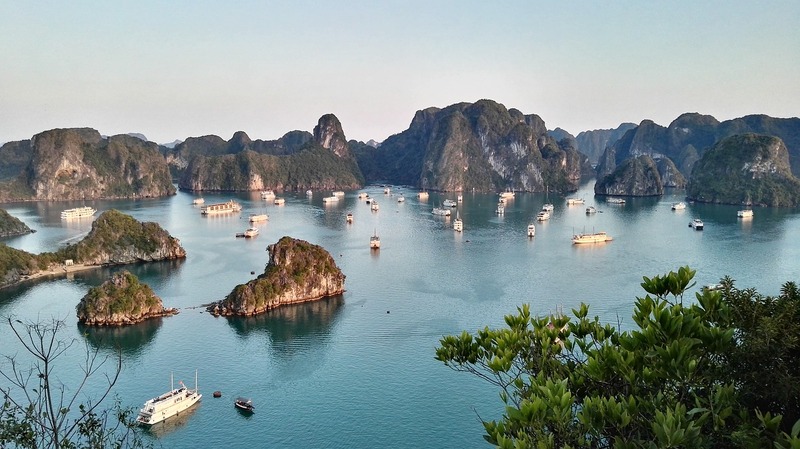 I’ll help you understand the differences between the seasons of Halong Bay, and at the end of this article, you’ll know the best time to visit this world heritage. If you’re in love with the shape of this beauty and want to know it in detail, read this! To me, spring is nature’s way of saying: “Let’s go to Halong Bay!” The climate of Halong Bay follows the typical weather of North Vietnam. This means that it belongs to the tropical monsoon temperature type: hot summers with high rainfall, and a cold winter with rare rain. In spring, the temperature ranges from 19 to 24 degrees Celsius. With this type of climate, you are very likely to observe spring drizzle and early morning mist. Halong Bay has somehow inherited beauty through the ages, but its gentleness and elegance only ignite in spring! In this time of love, the blooming orchids flourish in the refreshing air and the growing buds create a majestic new year of nature. The caves in spring are reborn with new mysterious outfits of mist, so they’ll make you feel as if you have found a wonderland! In spring, there are days in which Halong Bay is completely engulfed with thick fog, so you can barely see anything in front of you. Some travelers feel inconvenienced by this lack of sight, but if I were you, I’d take advantage of this once-in-a-lifetime chance! Isn’t it the best opportunity to say lovely and cheesy words to your darling without being spotted by strangers? In these foggy days, Halong Bay also looks like a romantic watercolor painting, you can feel the calm of the ocean, the precious air in your lungs, and the hug of the mountains. It’s also very quiet and sometimes you don’t see the many boats cruising around you. You feel as if you are the only one in Halong Bay! Moreover, during springtime, walk on the beach under the shimmering moonlight, your soul will be set free and all your stress will be washed away. And when it comes to April, you can say this is one of the most wonderful times of the year! In spring, the weather is cool, so rock climbing, biking, kayaking, or cruising are the ideal activities. If the weather is warm enough, this is the time for you to jump right into the sea! Spring is also the squid season in Halong, so you should spend a night catching squids with Halong fishermen. Enjoying your achievement after hours working will remind you how food is not only about the taste, but it’s also about the memory of a genuine encounter with local people. One recommendation for hikers is to get to Cat Ba National Park! Pro tip: Don’t forget to bring a sweater to prevent any possible cold. Furthermore, the Vietnamese New Year (Tet) frequently occurs in February, so many people will return home to visit their families for about a week. As a result, some traveler destinations, including state agencies, will close during this time. So make sure that you check it carefully to make the most of your trip! Summer is not a bad time to experience Halong Bay. However, it is often difficult to forecast the weather. Rainfall will visit the bay more often, along with the heat and sultriness. Especially in late summer, the weather can quickly turn to long downpours! The average temperature is about 30 degrees Celsius, so it can cause discomfort if you easily overheat. But don’t worry too much, because, in return, the cool breeze of Halong Bay will make you feel better. 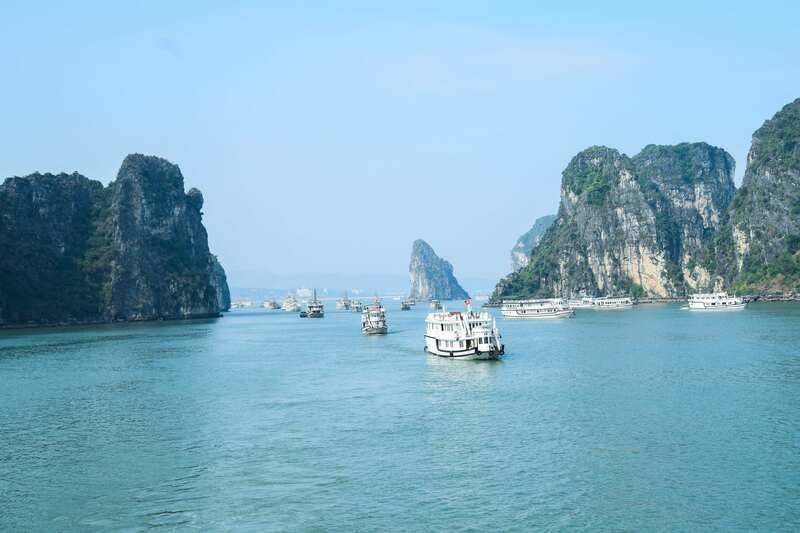 On sunny days, Halong Bay is regarded as an ideal destination because of the blue sky, sunshine, and white sand. 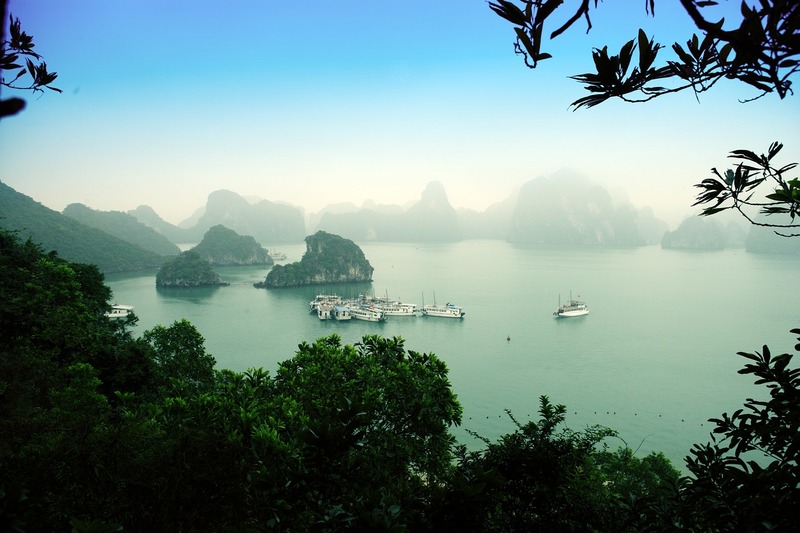 You may not know this, but CNN voted Halong Bay as one of the top five tropical island paradises! When sunset falls, the water reflects the peaceful yachts, the sleepy flowers, and the flock of birds returning home. And believe me, you can stay up all night as the air begins to cool to watch the moonlight reflect on the ocean and karst monoliths! Some activities may be postponed due to bad weather (heavy rain, windstorms, etc. ), so you should prepare an alternate way in advance to avoid any interruption during your trip. On rainy days, you shouldn’t take part in mountain climbing. Instead, let’s stroll to local markets, buy souvenirs, and join a cooking class. Furthermore, in summer, the beach is always packed with Vietnamese and foreigners, so if you don’t like chaos, you’d better stay in your boat or sunbathe instead. Pro tip: Don’t forget to bring swimsuits and sunscreen to have the most fun on the beach. Moreover, prepare a raincoat or an umbrella on hand to make sure that you won’t catch a cold from sudden rain! The weather of Halong Bay in the fall is sunny, windy, and the temperature lowers two to three degrees. In the middle and late fall, when the weather is consistently cool and is less rainy, it’s the best time for you to travel! Fall is such a magical time! The hearts of the flowers, trees, and water beat at the same pace! Watching the sailing boats gradually appear with the rising sun will remind you that joy is best found in the simplest moments. When the rainy season is over, it means that outdoor activities are coming back to town! Apart from swimming in the beach, you shouldn’t forget to experience exciting activities such as kayaking, mountain climbing, or admiring the beauty of the bay from the one-of-a-kind seaplane! Pro tip: Shorts, t-shirts, and swimsuits are a perfect combo for an awesome trip. As summer and fall go by, it seems that Halong Bay has come back to its true identity in winter. The average temperature is about 17 to 19 degrees Celsius, and during this time, you will have a chance to discover a different Halong Bay – a tranquil creature. It will be your biggest regret if you ignore the beauty of Halong Bay in the winter! In contrast with the insane number of people buzzing to the bay in summer, Halong Bay in winter is less busy and touristy. The weather is also more gentle, mild, and humble. If the sky in summer is an energetic teenager, it looks more mature and thoughtful in winter since it has grown up. The highlights of the Bay are the limestone cliffs, the meek fog, and the boats going back and forth unendingly. In winter, as the weather gets colder, you may feel unsatisfied if you want to bathe in the sea. But in return, it’s the perfect time for you to hike, watch the bay from a seaplane, and admire its beauty from your boat. Winter is also considered to be a fantastic time for leisure travel. So don’t hesitate to come here, experience the sheer beauty of this amazing bay, immerse yourself in hot tubs, and get ready to be wonderstruck! Pro tip: If your trip is in January, you should prepare a warm jacket. Don’t forget to bring a swimsuit, because there may be sunny days and the water could be warm enough! Some cruise ships even have hot tubs! Final pro tip: If you are looking for an awesome tour to Halong Bay, check out our private Onetrip Ha Long Bay adventure. 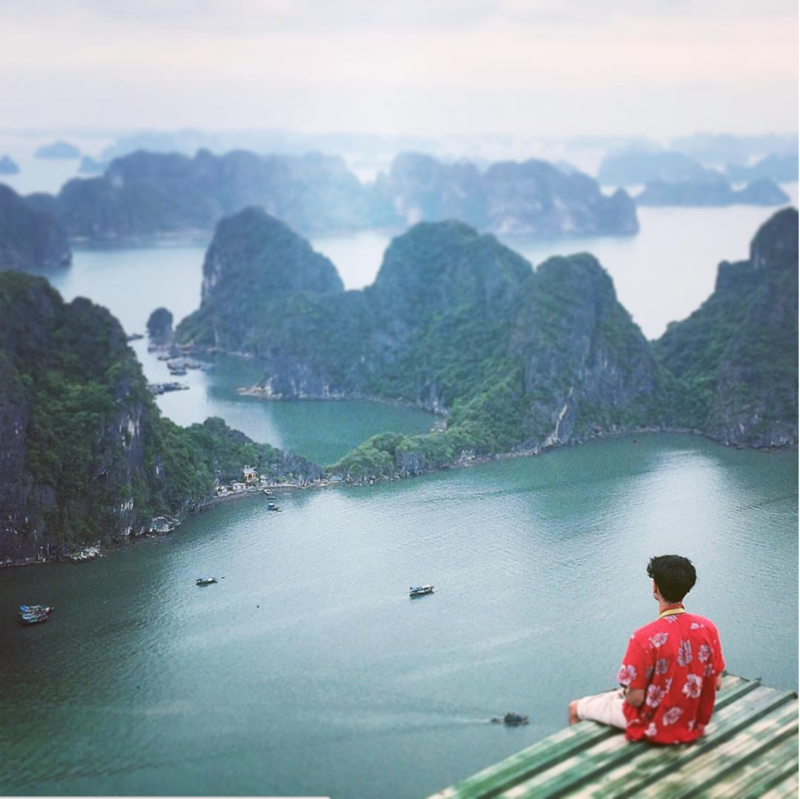 There are many tours out there, but this one is special because you will discover Lan Ha Bay – the southern part of Ha Long Bay which is favored for its unspoiled and magnificent natural beauty. Get the adventure started! There is no right or wrong answer when it comes to visiting Halong Bay. It’s up to you and your timeline, so just relax and let your heart decide! 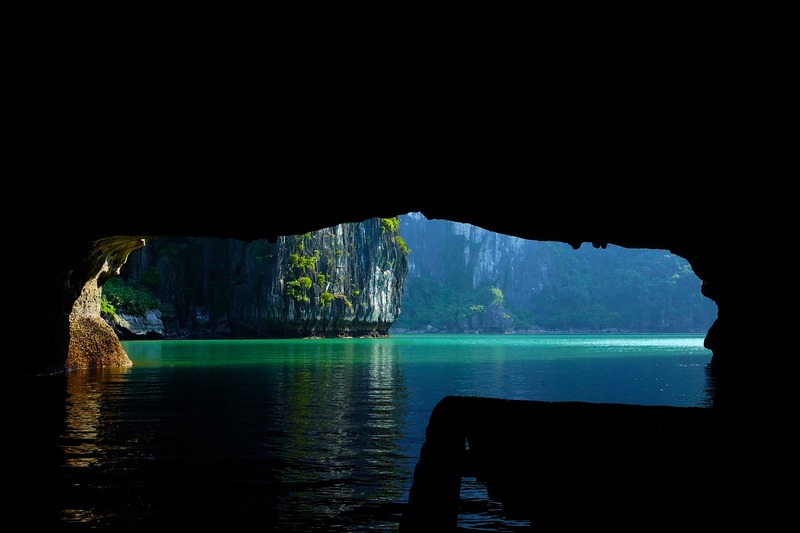 And don’t forget to check out our articles about Halong Bay, because the more you know, the more you’re going to get! This is very helpful to all tourists planning to visit Vietnam especially they’re a well-known tourist attraction which is Halong bay. I’ve always wanted to see the famous emerald waters and thousands of towering limestone islands topped by rainforests. 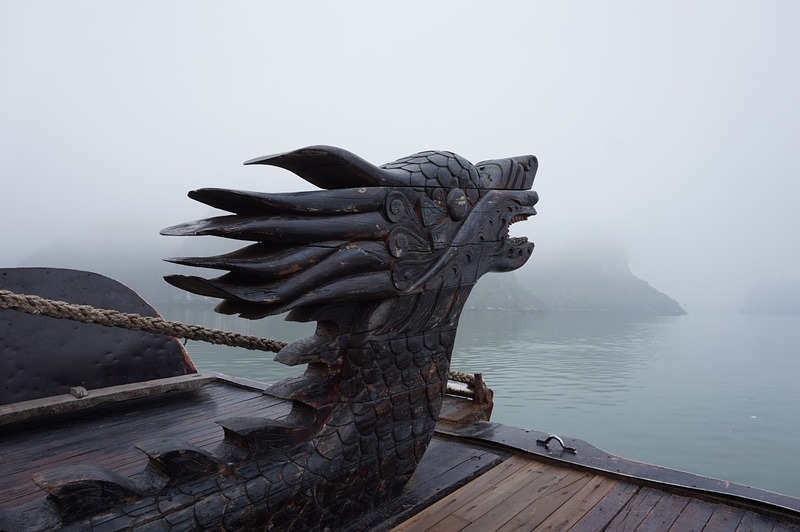 I’ve always wanted to ride the Junk boat tours and sea kayak expeditions to see the famous Islands there like the Stone Dog and Teapot islets. Really thankful for this blog post! Thank you! I hope that you had a good time reading it!